Quick Red Beans and Rice made with The Trinity, bacon, smoked sausage and canned kidney beans - you'll never believe they're a shortcut version! Red beans and rice made from dried beans are delicious, but of course, like any dried bean, take a bit of time to stew down to delicious creaminess on the stove top, so there is a bit of a time commitment. When I was living in New Orleans one of the gals that I met through my then boyfriend was a true born and bred New Orleans gal who had lived there all of her life. We hung out with them regularly, and one evening she and her husband invited us over to watch a movie and eat red beans and rice for dinner. She and I were in the kitchen chatting and I noticed that she was only just then beginning to sweat down The Trinity, and I didn't notice any beans going on the stove yet either. I remember thinking, this was gonna be some late supper! Then, I saw her reach into the cabinet and much to my surprise, pull out cans of kidney beans. What?? Now ... even over here in Mississippi, I always knew red beans and rice to come from dried beans, and though the process of preparing the beans can be shortened with the quick boil method, it is still, well, a process that takes a few hours to complete. I had never seen anybody make red beans and rice from a can, never mind somebody from New Orleans! Well, yesterday, I was in the mood for red beans and rice but when I went to the pantry, I didn't have any dried beans. Now I've been wanting to do a shortcut version of my homemade red beans, and since I do keep the pantry stocked with canned beans, this was the perfect opportunity to experiment. I grabbed some cans of kidney beans and knew with some simple conversions, I could turn those cans into a respectable red beans and rice. The seasonings are pretty much the same as my regular homemade red beans and rice, though some of the methodology is a bit different. You can't just dump some canned kidney beans in a pot and call them red beans and rice, so you've got to build up some layers of flavor, since you're missing the nice, long stewing time. I gotta say, despite the shortcuts, these taste pretty darned close to homemade from dried beans y'all. One thing. DO NOT add salt to these beans until the end! There is a little bit of salt coming from the meats and Cajun seasoning, but there is plenty of sodium in the canned version of beans that you likely will not need any salt at all, but definitely do not add salt before you taste them. In fact, if you're watching your sodium, be sure to drain and rinse the beans, use low sodium chicken broth, and use a bit extra as needed. Rinsing canned beans before use removes most of the sodium. Blue Runner brand kidney beans are excellent and for this shortened version of red beans and rice make the best beans, although any brand of light or dark kidney beans, and yes, even generic, work very well. If you can't get your hands on the Blue Runner Creole cream style kidney beans, just substitute two cans of regular beans and mash them to the consistency of canned refried beans. I still have peppers coming in the garden so I used a couple of green chilies that I had picked the other day. I seeded and removed the ribs, and used them in place of some of the sweet bell pepper. It provided a nice gentle spicy tingle to the lips and taste buds, and did not disappoint. You may substitute jalapeno peppers to punch that up even more, or just use any color of sweet bell pepper - yellow, orange, red or green - to keep it on the mild side. I mostly use green bell pepper for my red beans, but for these photos I had a yellow that I needed to use up so that's what I used here. 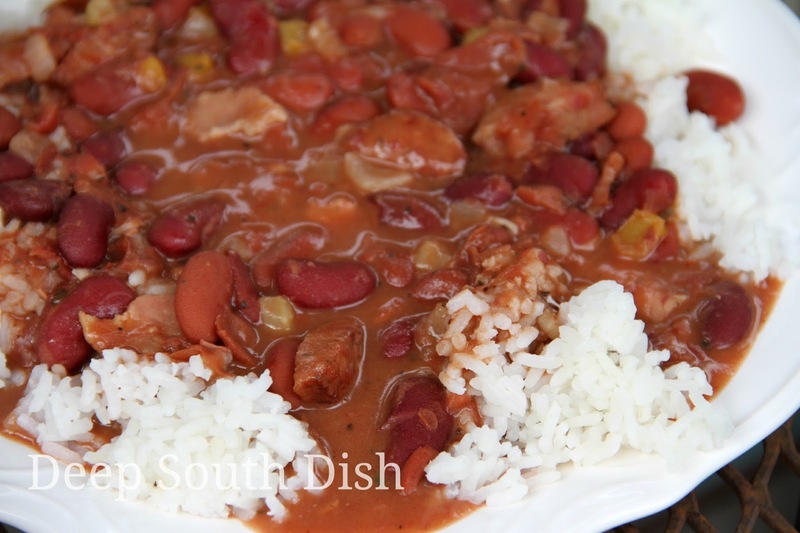 Here in the Deep South, red beans and rice are often a main dish, served with a side of some kind of bread, more often than not, Pistolettes, a French bread style roll, rather than cornbread, but they are often a side dish too. They go well as a side to any kind of pork chop and you'll often find them served that way here where I live. Check out more of my favorite bean recipes on Pinterest! Heat oil in a large, heavy bottomed skillet or pot over medium high heat, add the smoked sausage and cook until lightly browned. Add the bacon and cook until soft, but not browned. Add the onion, bell pepper and celery, cook until softened. Add the garlic, basil, Cajun seasoning, pepper, and bay leaf. Stir in the beans and enough of the chicken broth to reach the consistency desired; bring to a boil. Reduce heat and simmer, uncovered, about 15 to 20 minutes, or until cooked through, and slightly reduced and thickened. Serve as a main dish over hot, cooked rice with a mixed garden salad or green veggie, or as a side dish with meat and a veggie. Cook's Notes: Do not add any salt until the end of cooking time and only after you have tasted it. Canned beans contain plenty of sodium, so you likely will not need any. At the end of cooking, taste and adjust. If you are watching sodium, rinse the beans well, and use lower sodium chicken broth, adding in a bit more if necessary. If Blue Runner brand cream style canned beans are not available in your area, substitute canned regular light kidney bean, mashing two cans. May also substitute leftover ham for the sausage, or use both ham and sausage. Looks and sounds fantastic! My hubby is from Mobile so when we are in town visiting, I make it a point to have red beans and rice. SOOO Tasty! I like your quick version...good job! Gorgeous! I'm a big fan of rice and beans and your shortcut version sounds just perfect! Oh Mary these sound great! Man I just love red beans and rice. Really any beans and rice. I have yet to see creamed kidney beans in the grocery stores here. I guess I had better start searching if I want to try this! Blue Runner is the way to go! Love this- this is about as "New Orleansy" as it gets! I love canned beans in dishes. Such a wonderful time saver. I will try your recipe! LOVE red beans! They are super healthy! Just made these for supper, and had to tell you how much my family enjoyed them! Took just under an hour, start to finish, but tasted like they had cooked all day. Definitely will do this again! I had no problem finding Bluerunner Creamed Beans in North Mississippi. Thanks for the recipe!! I have been looking for a good cajun recipe blog site and so glad that I came across yours! I wouldn't try any recipes until I got the Slap Yo Mama's cajun spice! We were in LA a couple weeks ago and just bought it before we returned back home to MD. This recipe is sooo good and sooo simple! Thank you for sharing! You are so welcome Stephanie! So glad y'all enjoyed them. The homemade version from dried beans is great of course, but this recipe is such a timesaver and is a pretty close match. Happy New Year!! These are a staple in our house. The only difference I do is use two cans creamy beans and one can light red kidney beans. Bake some hot cornbread, iced tea...and throw some green onions on the side. Yum. And don't call me late for supper Judy LOL!! Thanks for stopping by. I am northern raised, but have a southern soul. Being 7 months pregnant, I was craving some comforting red beans and rice BUT there was absolutely NO way I was waiting all day for it. Stumbled on your blog, and my hormones and husband are very grateful I did. It was absolutely amazing! Never thought I could have such a tasty meal in an hour. Would have been much sooner, but with a 2 year old, sometimes things get to brown and simmer longer (no complaints since it was extra flavor, not plain burnt this time lol). I can't wait to check out more of your recipes! Thank you so much for taking the time to come back by and let me know and congratulations!! This was fantastic, looking forward to my leftovers tomorrow! My daughters ate every bite; which is high compliments from them. Going to have to try the from scratch method next time. That is a compliment - so glad they enjoyed them! Even faster--use a box of Zatarain's. Love red beans and rice. This is how I've been making mine for about a year...and I'll never go back to from scratch. Too easy and too good! Oh I still make the from scratch the most, but these shortcuts beans runs a pretty close second for me! just finished putting this together and WOW it smells awesome!! can't wait to have a big bowl later today. just don't tell anyone i'm eating red beans on sunday. :) thank you from one of your biggest fans! Oh. My. Word. I made these for dinner last night and they are awesome! So awesome in fact that I'm having leftovers for breakfast! Thanks Kathlyn - I'm so glad that you enjoyed the recipe! I made this a few weeks ago pretty much by the recipe (I didn't have any bell pepper, so I guess I had a Duo instead of a Trinity, ha!). I also had to substitute smoked kielbasa because I already had it on hand, and it was so awesome! Even my four year old cleaned her plate. It's a perfect day for another batch, with this yucky weather and all, but this time I'm going to use the Trinity, and see how it works if I throw it all in the Crock pot after the first two paragraphs of steps, just to let it all simmer low & get happy-happy-happy for a few hours> I can get some laundry done and not have to babysit the stove, know what I mean? And hubby is working late tonight so I know it will still be ready whenever he gets home. I just hope it doesn't overcook. Thanks for a great site! I am from MS but live in Atlanta area now. and...I've been able to find the Blue Runner cream style beans at Walmart here. I do cook them in the slow cooker to so I'm sure that they were fine. You need a little bit less water. Hope you enjoyed the beans! I've been using a different recipe (using canned beans) for a few years now, but I always felt it was missing something. I already had the ingredients for the other recipe when I came across yours. So, I ended up using ground sausage and mashed 2 cans of kidney beans using their method. It was very good. Next time I'll be sure to use the andouille sausage. Or, if I'm feeling ambitious, I'll use your original recipe. Glad you enjoyed them Melissa! Decided to impress my Minnesotan friends with some Southern cooking like I used to get growing up. Unfortunately I decided too late to let beans soak overnight. Thank goodness for this recipe! They loved it and had no clue I used the "shortcut"...it tasted like the real deal. Thanks for sharing! 1st time I saw this done I was at a friends house. Just like you I did a double take when I saw him taking cans of beans out of the pantry. I just knew this would be some mediocre red beans and rice, but I was wrong. I've been using canned beans ever since, it's so much faster, and to tell the truth, the difference in taste is negligible. I do still love the slow stewing ones & make those the most but long as you treat the canned beans by building some layers of flavor, they turn out pretty good too!! I am a big fan of the Blue Runner beans and try to keep them in my pantry. If I can find them that's what I usually use for Red Beans and Rice. Fred's Dollar Stores usually carry them and noticed just recently that Walmart has them now in a larger size. I just made this and it was fantastic. I used full 3 cups of broth. We like the beans very soupy. 3 parts beans and 1 part rice in our bowls. Green onions for garnish. Love this website. Texas girl in Arizona. Thanks so much - glad to hear y'all enjoyed the recipe!! My I absolutely loved his recipe! I'm always looking to try new dishes and being that I'm a native NYer currently in the south red beans and rice is not something I grew up eating. This short cut was a breeze and the BlueRunner beans were easy to find in Publix. My fiance loved this. I've made this a few times and mix half andouille sausage and half jalapeño smoked sausage for a kick...delish! Thanks for sharing! You're very welcome & thank YOU so much for taking the time to stop back by and share! I truly do appreciate that. You're welcome Janice & I have to tell you, this recipe is very, very close to the flavor of the longer version from dry beans - only a tad bit easier! Blue Runner is the best! I usually make the dried, but for quick, ya can't beat em! New Orleans, Lafayette, Houston and other places! I usually make them from dried beans too and Camellia brand are the best there, but yes, when you're in a hurry, you just can't beat the quality of Blue Runner beans for canned beans. I still like to treat them seasoning wise like I do my dried bean recipe, but they certainly make for an almost homemade taste. Love them! I love red beans and rice. Was a labor of love I indulged in occasionally because the work involved wasn't suited to kids and jobs. While I will admit that the long hard way is fractionally better than this method it is a very minor difference I forget all about by the second bite. Thanks to you and this recipe I can eat something I love far more often than I was able to previously. You're welcome Jim - so glad to hear you enjoyed the shortcut version! Ive used this recipe several times now and we love it. Its just as delicious as the-all day,slave over the stove-version. Thanks for sharing! You're welcome. It's amazing what a few tweaks can do. Glad you enjoyed the recipe! This was delicious! Used Best Stop Andouille and Blue Runner beans. Came out great. Awesome! Glad you enjoyed the recipe.